Sheaffer Balance 1000 fountain pen from 1941-42. It would have been called a Statesman. Brown striated lever filler with gold-plated trim, and military-style clip. No white dot, so the price imprint on the barrel and nib indicate a replacement cap. 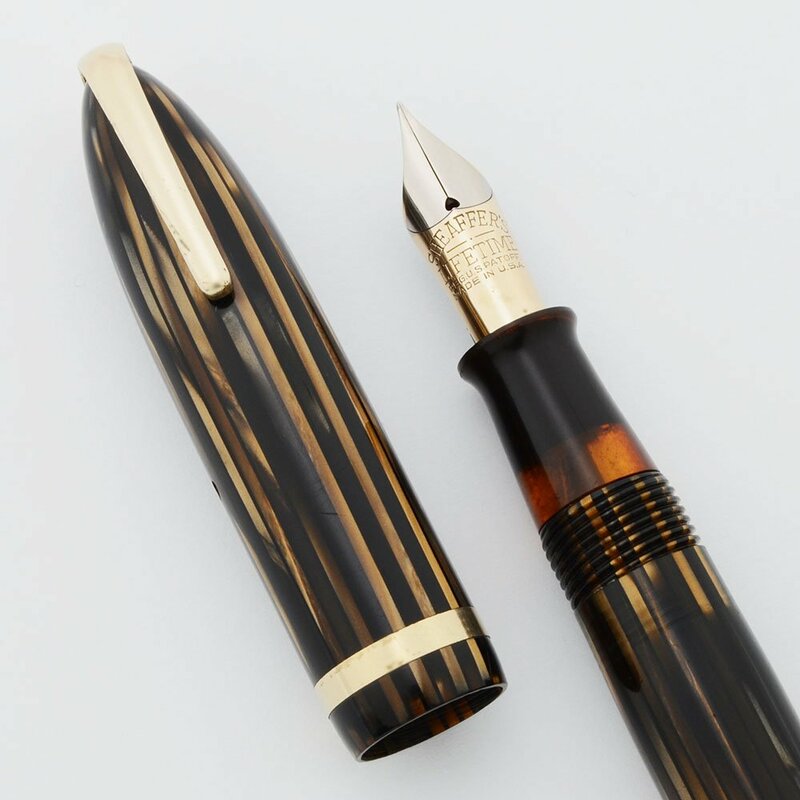 Fine Sheaffer's Lifetime 14k gold two-tone nib is smooth and firm. The pen is in excellent + condition. It has been fully restored and is working well. Type Vac-filling vintage fountain pen, restored and working well. Product Name Balance Lifetime 1000, full size with the military clip. Around 1938, these Balances gained specific model names. This one would have been called a Statesman. Manufacturer and Year Sheaffer, made in USA -- 1940-42, these are the years this this clip was used. Filling System Lever filler. A new sac has been installed and tested. The filling system is working well. Color Brown striated celluloid cap and barrel with gold-plated trim and a military-style clip. The cap should have a white dot but because it doesn't we suspect it is a replacement. 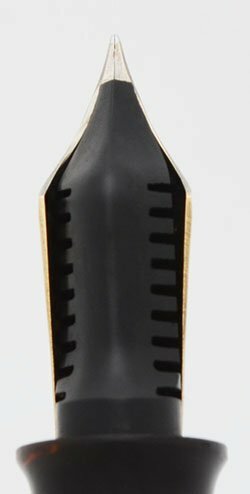 Nib FINE two-tone 14k gold Sheaffer's Lifetime nib is smooth and firm with nice tipping material. It has a a bit of a "waverly" upturn. There is a slight gap between the nib and the feed that doesn't hinder ink flow. Condition Excellent + condition. No cracks in the cap lip, but it should be noted that these striated Balances crack easily, so the cap should not be posted. The pen has microscratching and handwear. There's very little plating wear and the imprint is clear, including the hard to maintain 1000. viewing window is clear. Note that the cap is likely a replacement as the original would have had a white dot. The pen has been fully restored and is working very well.